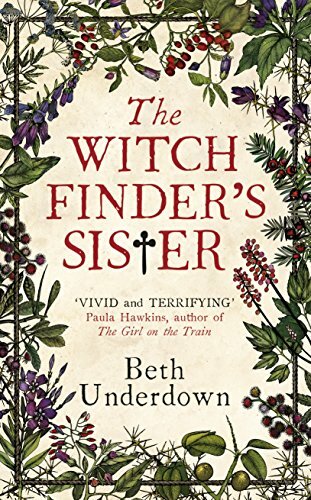 I can’t find any info about previous books so I think this must be Beth’s debut novel – and what an intense and complex read for a first story! So, Matthew Hopkins- I recall learning about him at school, along with the US Salem witch trials. The Crucible was one of our set text English reads. He’s cropped up as a side character in a few books since then, but I’ve never really thought much more about him. Here Beth’s given him a fictional sister, though he may have had a real one Alice is purely invented for this story. It works well, she’s a foil to him, shared upbringing, and a way to let us see his actions from someone who loved him as a child but grew scared and confused of the man he became. He’s a strange person, and as we learn about his upbringing there are elements slowly revealed that could have impacted upon his actions now. Others have had far worse happen though, and don’t turn into people like him, so its part explanation but not as simple as the whole cause. He really was a enigmatic character, phlegmatic about what he needed to do, unemotional, even when it means tearing apart, condemning to death, people he’s known since childhood. I can’t decide whether he’s just cruel, vindictive, out for revenge, totally mad or whether he really believes in what he’s doing. From a small start his witch hunt takes on a life of its own and snowballs, and maybe the power pushed him to go further and further, made him feel righteous, invincible? Who knows, and after finishing the story I still don’t know. Beth offers lots to speculate about but the reality? He was real, he did what we now see as horrific things, but which at the time were backed by other important people, landowners, local politicians – well, what passed for them in those days, the Church even. It was as if nothing could stop him from this path he’s set on, and the longer he was “successful” the more righteous he got. Success bred more of the same methods, even when the causes of it were wrong. Its a bit like that sink or swim test, he was pushing people to their limits physically and mentally and when they “confessed” through exhaustion, pain, thirst, would say anything to get some tiny relief he seized upon it as evidence his path was right, and went even further. Alice, poor Alice. Her mother died when she was very young, father remarried and had Matthew, but his birth left his mother frail and Alice really took over his upbringing, loving and looking after him. Even then the public face, showing the happy family outside, the father who was a priest, a good man, the mother who simply tired easily, was hiding things, secrets that kept slipping quietly out, and building background to the current events. I so felt for Alice, she’s a good woman, widowed from her beloved Joseph, a servant’s son, whom Matthew did not approve of, she’s still young, in her twenties I think, and forced to come back and live off Matthews charity. She can see events unfolding, sees at first hand what’s going on but is powerless to stop anything. She tries though, tries to do what she can but Matthew is an unmovable force. Her small brother has grown into a confident and powerful man. He takes little note of her, and at times seems to really dislike her. she becomes just another tool for him to use in his never ending quest for witches. Too much pressure or intervention and she risks her own place in his home at best, risks getting caught up in the hunt at worst. Witch hunts, back then not knowing the cause of events, accidents, tragedies, people looked for someone to blame, and it was easy to pick on one person a little on the outside of society, and call witchcraft and the intervention of the Devil the cause. Now we look back and think how could they really believe that, but its a poor, uneducated society, and its human to want to blame someone or something. Not every thing has an explanation though, and there are a couple of events here that gave me the shivers, defied rational thinking. Sometimes I think we haven’t moved on that much, we still look to blame others, though not as witches but in some 21st century way. In the UK we’ve just voted to leave Europe, mainly because of the hype and untruths certain media factions told about immigration, and it brought up the same kind of feelings as in this book, where people want to blame someone for misfortune. In the UK lack of money for NHS and other public services was blamed on immigration – scaremongering, but a spark that when fanned turned into a fire. Hitler did that back in the 1940’s with his attempts to stamp out minority groups, terrible things happened as those who could have stopped it turned a blind eye, much as those in power when Matthew Hopkins let him get away with his crimes. Then there’s the US and the political system there, where another modern witch hunt has let a racist, sexist, xenophobic bigot race to the top place for power. Scary stuff but proves that witch hunts aren’t just confined to history – but have their own modern day version 😦 “The Only Thing Necessary for the Triumph of Evil is that Good Men Do Nothing” Edmund Burke et al. A fabulous book, uncomfortable reading at times, which felt so very real, took me back in time, made me understand a little more about the awful events that took place back then. The characters were wonderful, felt so real, I was scared for and of them, depending on which ones of course. I loved the way secrets were teased before the reader, parts revealed slowly, hints of what may have been relevant or may be just superstition taunted through, making me second guess my thoughts. In fact its not until writing this that I’ve connected a couple of major points that could have been the catalyst for Matthew’s quest. Its a fascinating first book, well researched, marrying real events and people with fictional ones to create an amazing story. I’m not sure its one I’d reread but its certainly one I’m glad to have read. Stars: Five, incredible book, uncomfortable at times but so very, very real feeling.